President Obama speaks against Islamophobia and on the other hand is passively reinforcing the framework that Muslims and terrorism are synonymous or have to be in the same conversation, Dawud Walid, Council on American-Islamic Relations told RT. 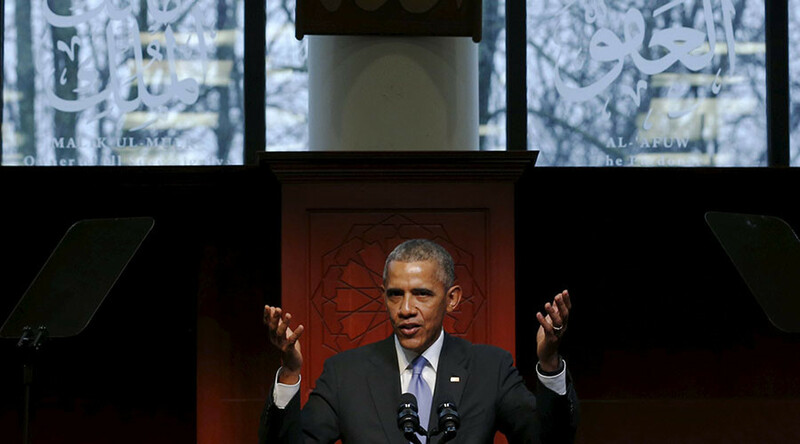 US President Barack Obama delivered a speech at a mosque in Baltimore, Maryland on Wednesday. It was his first visit to mosque in the US, and was meant to comfort the American Muslim community. Obama was attempting to make it clear that Muslims are more than welcome in the country. RT: Obama says he visited the mosque to support American Muslims, but people on twitter seem to think it is too late for that. Why has this issue provoked such a blowback? Dawud Walid: Well, I don’t think that was too late for him to visit a mosque in America. However, there is a growing frustration of what President Obama, where many people of our community feel that, on the one hand, rhetorically he says a lot of good things and speaks against Islamophobia, but at the same time some of its policies in fact negatively or adversely affect the American Muslim community as well as some of his policies relating to the West going on in the Muslim world. RT: Why did Obama decide to visit a US mosque only now at the end of his second term in office? DW: I think that is something to be asked of the Obama administration – about why he waited so long. But we really as a community needed him to have come to a mosque and to been more vocal six years ago. Since the presidency of Mr. Obama Islamophobia has increased dramatically in our country, and it would have been better if he came out, if not at his first term if he was scared about not getting reelected, but definitely at the beginning part of his second term. He would have been better if he would have come out, but as I said at the beginning, for me it is better late than never. RT: The US President has long been criticized for being all-talk and no-action. Are there any particular steps Obama has taken during his years in office to ease social integration for Muslims in the US? DW: Words matter, and he has on a number of occasions on a national platform- including the State of Union Address - spoken out against anti-Muslim bigotry, but the irony of today’s speech and Mr. Obama’s track record is why he speaks against overt Islamophobia. On one hand, he can’t seem to ever have a conversation related to American Muslims without mentioning global terrorism. And the irony of today’s speech, in which he invoked Paris and what the DAESH is doing halfway across the world, which has nothing to do with the American Muslim community, is that he is in a way passively reinforcing the framework that Muslims and terrorism, or American Muslims and terrorism, always are synonymous or have to be in the same conversation. That is really the most frustrating part to me about Mr. Obama’s speech today or his problematic CVE, or Countering Violent Extremism program, that he has going on right now.